Lake Ohrid is Europe's oldest lake and is believed to have been formed as early as during the Tertiary period at least 4 million years ago. Presently, there are two well described salmonid species in the lake, the Lake Ohrid brown trout Salmo letnica (Karaman) and the Belvica Salmo orhidanus. For Lake Ohrid brown trout, there have been up to four intralacustrine forms described, but presently, we have not succeeded in defining these forms from a genetic perspective. 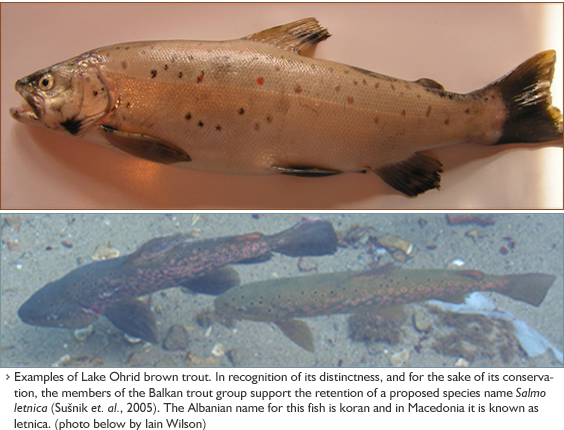 Lake Ohrid brown trout have clearly arisen from within the brown trout species complex, and so their taxonomic status as a distinct species is controversial. Our data do show that they have been isolated from all other brown trout populations for a long time. The Belvica has a long taxonomic history, as it has been previously characterized as belonging to its own genus (Salmothymus or Acantholingua). Several genetic investigations (e.g., Phillips et. al., 2000; Sušnik et al., 2005) have shown that Belvica are a clear member of the genus Salmo, and are most closely related to the softmouth trout. Both Belvica and Lake Ohrid brown trout have been heavily fished commercially, and there is great concern about their conservation status. Sušnik, S., Knizhin, I., Snoj, A., Weiss, S. 2005. J. Fish Biol., 68, supl. A, 2-23.